Everything you need to transition from traditional flasher to high-tech Fish Finder. Look to the STRIKERTM Plus 5 Ice Fishing Bundle if you want a ready-to-fish package that delivers. 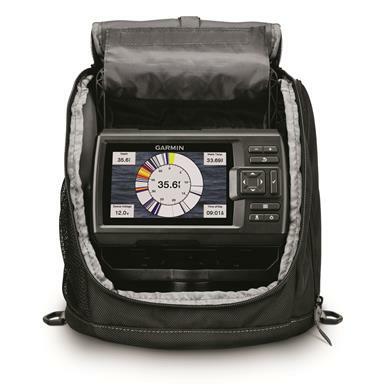 The STRIKERTM Plus provides you with both a Fish Finder and flasher all in 1 unit. If you're used to using a flasher, you’ll love the easy-to-read, built-in features. Plus, its ice fishing transducer gives you crisp, clear fish arches and excellent target separation, and supports ClearVü scanning sonar. You'll appreciate the built-in GPS and Quickdraw Contour mapping software for marking your favorite spots. Bundle includes: STRIKER Plus 5 Fish Finder, GT8HW-IF high-wide CHIRP ice fishing transducer, portable carrying case with handle, rechargeable battery, battery charger, foam float, power/data cable, tilt/swivel mount, hardware, Garmin bumper sticker and user manuals. GT8HW-IF transducer is perfect for ice fishermen who want clear bottom definition under the ice as well as crisp, clear and wide fish arches with excellent target separation. Built-in CHIRP technology gives you a higher level of clarity and detail than your standard 77/200 kHz transducer. It does this by sending a continuous sweep of frequencies, from low to high ranges. It then interprets these different frequencies upon their return to the STRIKER Plus. Because different frequencies are used, the information you receive gives you a crisper fish arch with greater target separation. The wider beam width reaches up to a 24° beam angle for a larger coverage area in the water, so you know what’s coming. Vertical, stationary fishing is easier with Built-in Flasher. Not only can the STRIKERTM Plus give you an exceptional reading with CHIRP, but it'll also give you a leg up on stationary fishing with the built-in flasher. It's fantastic for ice fishing and jigging for crappies. While you're jigging, the STRIKERTM Plus 5 shows you how far up and down your jig goes, as well as if the fish are going after it. Dimensions: 7.4" x 4.5" x 2.1"d.